How many votes do you need to win? How many votes do you need to get to win an election in which voters get N votes (and the top N candidates win) and in which there are M people on the ballot? That was a bit of a mouthful, but the idea is pretty straightforward. We basically want to know how well you need to do to win an election, assuming there are no runoffs. An example may help. In Philadelphia, we are mostly a 1-party (Democratic) town and so many elections are basically settled in the primary. For our City Council, for instance, 7 councilors are selected "At Large" which means that they represent and are elected by the entire city. However, the At Large members are guaranteed to have 5 members from the majority party (Dems), and 2 from the minority (GOP), via a Plurality At-Large (or "Block Vote") voting scheme. Dems can cast up to 5 votes, and may not cast two for the same candidate. The top 5 vote-getters win, regardless of whether anyone has an absolute majority. As a practical matter, people typically only vote for 2 or 3. We have lots of elections like this in Philly, including for judges (which have their own complications) Commissioner race (2 slots, 2 votes for the Dems). And, of course, there's the limiting case where you have 1 vote, and 1 nominee. So let's say that you're a candidate for Commissioner, or Controller or At Large City Councilmember, and there are a total of, say, 8 people up for the job. What fraction of the vote do you need to get in order to be one of the winners? This obviously depends a fair amount on the distribution of the votes. You might have 8 candidates for DA, but 1 or 2 of them may be dominant, or the votes may be split more evenly. We want to get a sense of what does happen rather than what could happen. There's one limiting case: If you have 2 candidates for 1 slot, you need 50%. That's just a hard and fast rule. 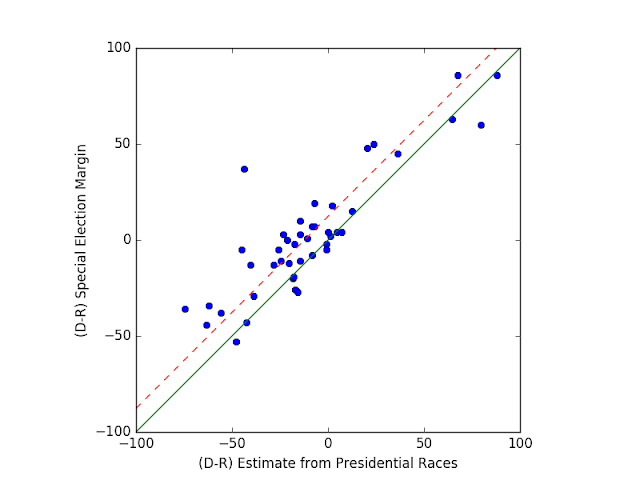 In general, we could imagine that the more people there are in the race (larger M) the lower the vote fraction you might need. After all, if the vote is split up more ways, it's probably easier to win. Likewise, races with fewer "winners" will require a higher fraction of the vote to win. 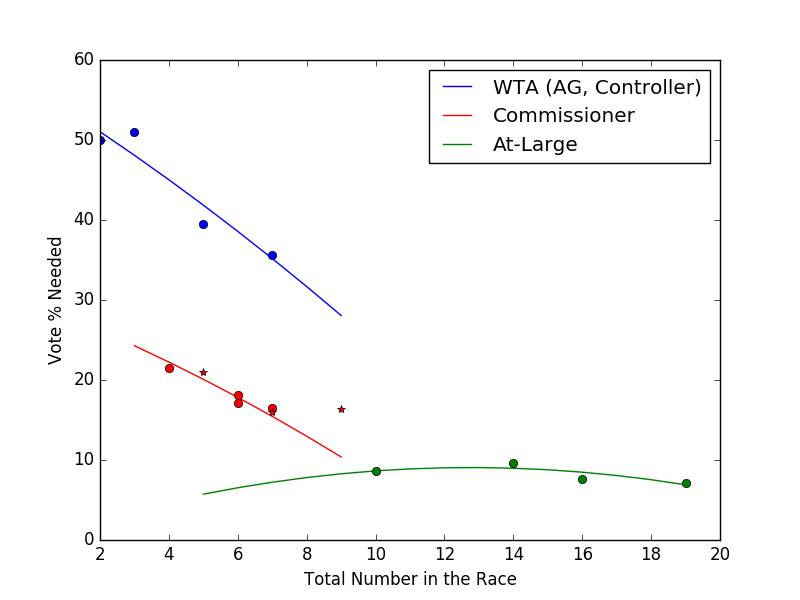 To win a race with 4 candidates (at least from these type of elections), you might expect to need about 45% of the vote. As expected, more hats in the ring mean you need to get slightly fewer votes to win. Does it work? Well, you tell me. The lines in the curve above are the theoretical results modeled from the data (the color tells you what type of election). But that simply means that we've fit the data we put in, not that we've found some general rule for the universe. As a minimal sanity check, I put in some Republican data: the last 3 At Large primaries for City council (in which they get 2 seats). The results are the 3 red stars in the plot above. 2 of the 3 are very good. 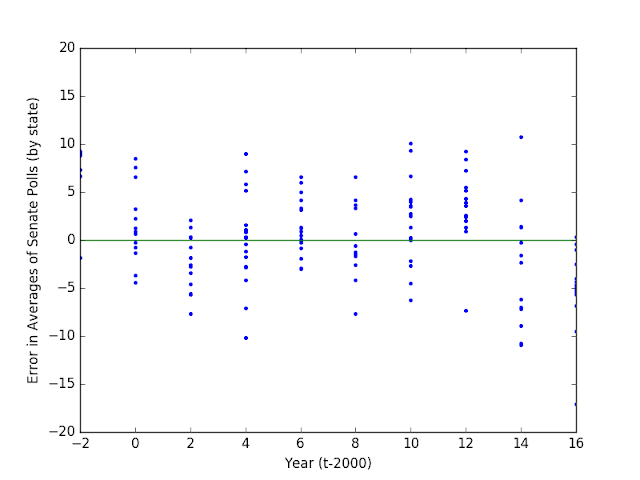 The 2011 results were off by about 8%, which in this range, is substantial. In a better model, I'd include errorbars, plus maybe something reflecting the incumbency or not for one or more candidates. For today, however, I figured some rules of thumb would be good enough. Not bad, just shy of the median. Where's the Generic Ballot At? Are the Democrats going to take the House this November? Good lord, I hope so. But by all indications it's going to be a squeaker. In a lot of ways, we have the wind at our back. The Republicans aren't even contesting a bunch of safe Democratic seats, which means that we get to save our resources for other fights. And upwards of 40 Republicans are retiring or trying for higher office. Incumbency gives something like a 7.5% advantage, so that's actually a big deal. Is a Miss as Good as a Mile (in Senate Polling)? The folks at fivethirtyeight published their weekly polling recap and in it, included a discussion of how badly Senate polls tend to miss their targets. The context, in this case, are a recent spate of polls that put Beto O'Rourke in spitting distance of the execrable Ted Cruz in the Texas Senate race. I'll let you judge the approach for yourself, but I, for one, strongly disagree with the approach that 538 puts forward. Essentially, the look at a bunch of historical polls and compare the absolute value of the polling miss with respect to the final outcome. But we already know that when it comes to polls, you need to look at averages. So I'm taking a different approach, and fortunately, I can do so, because 538 make their data publicly available.